The world of electric mandolin playing is still a small pond, but it’s starting to fill up with some big fish. Today’s catch is Ben Trout, who hails, appropriately enough, from Maine, a state known far and wide as a fisherman’s paradise. A former member of a band called Psykovsky, Ben has assembled a new five-piece rock ensemble named—you guessed it—Trout. You may have heard Ben play without realizing it: Clips from his Metalgrass CD have been used between segments on National Public Radio's All Things Considered (someone there apparently has quite a jones for mandolin music). Released in 1998, Metalgrass is really neither metal (at least not when compared to, say, Alex Gregory) nor bluegrass, but it is a nice eclectic collection of instrumental rock’n’roll with both progressive and folky touches. Trout’s main axe is a doubleneck 5-string/8-string "Junior II" electric mandolin built by Maine luthier Joel Eckhaus. He also plays a 4-string Flying V electric by Howard Needham and an F-style acoustic. This disc came out before Ben assembled his current band. In addition to mandolin, he plays all the guitar and bass tracks on Metalgrass, and indeed the tunes do have something of a "studio sound." One gets the impression that most of this material hadn’t been performed live much before it was recorded. Ben’s splashy compositions are full of tempting hooks, but tend to lack a strong melodic through-line. However, they do a fine job of showing off his talent, which is considerable. This guy is no fingerling—he puts up a fight like a 40-pound steelhead. The best electric mandolinists don’t just play a plugged-in mandolin; they incorporate techniques, developed for years by rock, jazz, and blues guitarists, that aren’t practical on acoustic instruments. Trout showcases a number of such techniques on the title track of this disc; you’ll hear some well-executed pull-off trills and note bends. Plus, if you want to know what a mandolin sounds like through both a distortion pedal and a wah-wah effect, "Metal Grass" will show you. "Sky Rats" has a promising uptempo start, but kind of loses its way in the slow section. Mindy Jostyn lays down some killer harmonica work on this tune, as well as on the acoustic, bluesy "Winter Hawk" (on which she also plays fiddle). "Wrong Bros. Boogie," with its clean, fluid, lightning-fast chromatic 16th-note runs, might be Trout’s best playing on the disc. About the drumming—courtesy of the tag team of Jeff Thompson, Gary Gold, and Val Michalski—I’m not qualified to say much, except that it seems fairly restrained (which is nice, actually—there’s nothing worse than a drummer who gets in the way of good mandolin playing). I’m glad I finally snagged a copy of this CD—it was almost the one that got away. 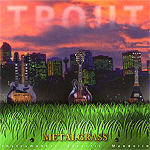 To preview Metalgrass, you can download MP3s from the Trout Web site. To order a copy, drop Ben a line at troutsounds@maine.rr.com. Go ahead and give Metalgrass a spin—you just might fall for it hook, line, and sinker.